This healthful and delicious salad may be served as a side or a lighter main dish. Hearty kale is balanced by the addition of sweet apples and a savory tahini dressing. To prepare the homemade dressing, simply combine tahini, lemon juice, olive oil, honey, garlic, salt and pepper. Once you try this dressing, you will find yourself making it over and over again! For perfect presentation, garnish the kale salad with a sprinkling of sesame seeds. They taste perfect when paired with the tahini dressing! Want some additional protein? Top with grilled chicken or falafel. Gala or Fuji apples are ideal for this, but use whatever you have that is fresh and delicious! Per Serving: 347 calories; 28g fat; 23.1g carbohydrates; 7g protein; 9mg cholesterol; 158mg sodium. Love this yummy kale salad with fresh crisp apples! The tahini dressing is also a favorite, I put it on everything. Perfect for lunch, or served for dinner with sliced chicken breast. 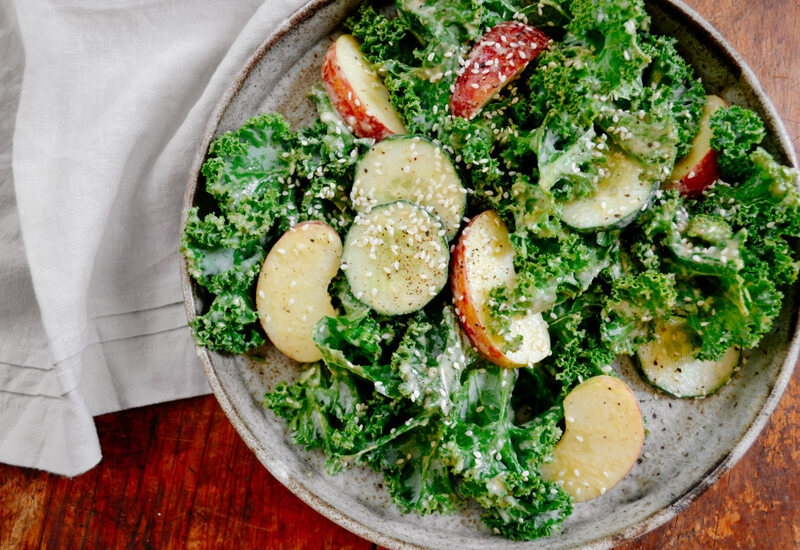 The tahini dressing was the perfect pairing for this simple kale and apple salad. The sesame seeds were nice for topping, I liked the added crunch, it was perfect for the overall texture and balance of this dish. Made this salad with spinach instead of kale, and added sliced grilled chicken I had leftover from the night before. It was the perfect lunch for work.